Pre Draft Report: Vance Worley was originally drafted by the Phillies in the 20th round of the 2005 draft out of McClatchy High School in Sacramento. Baseball America was bullish on Worley in advance of the draft, ranking him as the premier pitching prospect in Northern California, #16 overall in California, and #9 nationally. He was hitting 95 while sitting at 91-93, and threw a good slider in the low-80s. BA projected him to go in the 3rd or 4th round, but thought he could sneak into the supplemental first round. Worley came down with a sore elbow right before the draft and fell all the way to the 20th round. He opted to attend Long Beach State instead. Worley had a good college career at Long Beach. BA named him one of the Top 50 Freshmen in the nation in 2005, then named him the 27th best prospect in the Cape Cod Summer League in 2006. In its write-up on Worley in ’06, it noted that inconsistency was the demon: when on, he was still throwing 90-94 with a good slider; when not on, his fastball fell into the 80s and his slider became very hittable. Heading into the draft after his senior year, BA ranked him 24th in California and 121st nationally. His fastball was sitting at 91-92, peaking at 93-94, and he had also mixed in a two-seamer in the high-80s. His curve and change both needed work, and it was noted that while he didn’t walk a lot of batters, he was prone to running deep counts. It viewed his upside as a mid-rotation starter or a power bullpen arm. The Phillies ended up taking Worley in the 3rd round with the 102nd pick overall. Worley signed days after the draft and started his career in Williamsport. Career Synopsis: Worley began his career at Williamsport, but was quickly moved to Lakewood after just two starts. Between the two stops, Worley pitched 69 innings over 13 starts. He allowed 8 hits and a walk per nine innings, striking out 8 with a 0.5 home run rate. Heading into 2009, Worley was named the 16th best prospect in the system by BA and 15th by John Sickels. He skipped Hi-A and spent the season in Reading’s rotation. His season was rather lackluster. He was a midseason Eastern League All-Star, but having pitched better than 320 innings over the prior two seasons, it appeared to catch up to Worley and he tired towards the end of the ’09 season. His K rate fell below 6.0, his walk rate closed in on 3.0, he gave up more than a hit per inning and allowed one homer every nine innings. His star was dimming a bit heading into 2010. 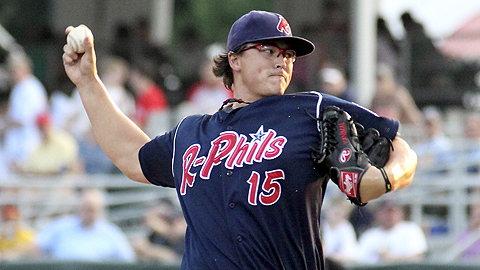 BA dropped him to #18 on the Phillies list, and Sickels dropped him altogether. His rates over 19 starts at Reading were quite similar to his 2009 campaign, save for a slight uptick in K rate and a slight decrease in hit rate. Despite fairly identical peripherals, Worley shaved over two runs off his ERA and garnered a promotion to Lehigh Valley. In AAA, he added another half strikeout to his K rate, and cut almost a full walk off his walk rate. Worley then got called up to the big team, made five appearances (two starts) and acquitted himself very well. Should be a competent fourth starter. Doesn’t have the ceiling of some of the guys below, but a much safer bet to make it. There isn’t much upside to work with, but Worley likes to attack the strike zone with his average arsenal and knows how to keep the ball low and hitters off balance. Upside: Worley is as complete a pitching prospect as the Phillies have in the upper levels. His fastball sits at 88-92 and he’s able to throw his slider and change adequately for strikes. He lacks a true out pitch and doesn’t rack up huge strikeout numbers, so the key to Worley’s success is getting outs early in the count. Worley heads to his first big league camp, but given the lack of a Joe Blanton trade and the continued existence of Kyle Kendrick, he’ll be fighting for a spot and innings. While he could conceivably serve in a bullpen role right out of spring training, the lack of other starting options behind him in the minors make it more likely that he starts the season in Lehigh Valley’s rotation, but depending on how things go in Philadelphia, he should see some time in the bigs this year and should stick for good in 2012. I’m working on adding a video of Worley’s MLB debut. His delivery is very simple, not a lot of moving parts, and that should allow him to throw consistent strikes going forward.